OK, you've voted. (If you haven't, what are you doing reading this? Go get in line and come back.) Right. You've done your civic duty! But what would life under Hillary Clinton as president really be like? Is her journey to the presidency really going to create change for this country over and above the symbolism of having the first female president in the Oval Office? (I mean, that's pretty cool in and of itself.) The answer is yes. 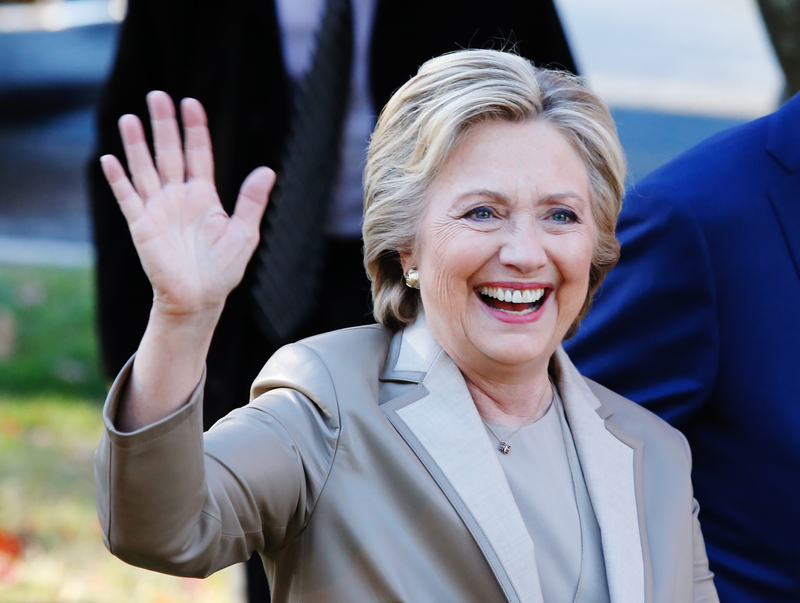 A Clinton presidency would likely change the shape of the country, the Supreme Court, college debt, the equal pay debate, and the media's treatment of the political elite. Every president changes the world, but a Clinton win would be truly earth-shattering for several very interesting reasons. As somebody who has had two female head of state (Julia Gillard in Australia, and Theresa May in the UK), life doesn't change as much as people appear to think that it does purely by virtue of electing a woman. You'd be surprised how quickly people get used to it, which is in and of itself a wonderful thing. (People will probably still pick on her pantsuit choices and her voice, incidentally, in case you're wondering if that will stop.) But life will actually be considerably different in other ways if Clinton wins, thanks to certain aspects of her agenda and the nature of coming to terms, for the first time, with the semantics of a woman in power. America will not be magically fixed overnight (the Black Lives Matter founder DeRay McKesson, writing on Medium, declared that he was voting for Clinton not because she posed a magical solution but because "there is much work that lies ahead, and Clinton is ready and prepared to do the hard work"), but it will see some interesting change and new opportunities. If you're crossing your fingers and every available limb for a Clinton presidency, these visions of the future should be at least part of the reason why. This is the big one. While it may not have been at the top of the ticket (this was an incredibly policy-free campaign, all things considered), Clinton's time in office would coincide with a period in which the Supreme Court has an open space following Justice Scalia's death, and where many of the remaining Justices are aging. The filling of that space, and of those that may follow over the next four years, may fundamentally reshape the Supreme Court and the decisions it makes. The Supreme Court hasn't had a liberal majority on the bench since 1970; for over 40 years, it's been dominated by justices nominated by Republican presidents. Clinton's actions could change all that, particularly considering that, in the tumult of this election, various Republicans have started to assert that they'll break party ties and consider anybody she nominates. In practical terms, this means a lot. No throwing out of Roe v. Wade; a likely end to the death penalty; better support for affirmative action; and, in one of Clinton's most fundamental campaign promises, overturning the unlimited campaign spending allowed by the Citizens United decision, which would fundamentally reform the way in which elections and campaigns are held in America. Clinton's out to change the way people go to college. She's pledged that part of her office's pursuits will be the New College Compact, in which public two-year colleges would be tuition-free for students whose families earned less than $80,000-$125,000 (the limit would gradually increase until 2021), repaying student loans would be restructured to be easier, and the entire concept of debt-free college education could come a little bit closer to reality for younger Americans. It's not likely to be popular, because it'll likely cost up to $350 billion over 10 years, mostly financed by tax cuts to wealthy Americans, which a Republican Congress would not like at all; but it's Clinton attempting to listen to what Bernie Sanders' voters really wanted, and putting it into action. On a more superficial level, America would be in the very intriguing position of having a former head of state as the spouse of a current head of state. It's not an unprecedented situation in world politics; Cristina Kirschner, for example, became President of Argentina years after her husband Nestor held the office. But it represents a new sort of challenge for the traditions of the White House and of press attitudes, which demand that the First Spouse remains involved in ways that are political but not overly threatening to the power of the main event. Michelle Obama's focus on the health of children was a perfect example; she was a powerful advocate and a behind-the-scenes resource without ever looking like she was acting as president. The press, particularly the right-wing press, will be focused on any sign that the First Husband (FHOTUS?) is trying to reassert his former grip over the White House, though I suspect Hillary has made her boundaries on that particularly clear. Are we ready to see a man second in command to his wife? Will people depict the FHOTUS doing Easter Egg hunts and community visits as emasculating, or empowering? Hillary Clinton is basically a decades-old boss at facing down sexist nonsense. And it's a very fair assumption to think that it won't stop just because she manages to get the most powerful position in American politics, and indeed on the world stage. There will likely be "light-hearted" discussions on cable television about how to address a woman in this position, as "Mrs. President" is definitely out and "Queen Patriarchy-Smasher" will likely slightly upset Congress. Madam President is where Newsweek has placed its bets, though I'm hoping that somebody, somewhere, puts in a vote for She-Ra. This is an election campaign that will echo and ripple throughout the histories of both major American parties, and potentially shape their futures significantly. Trump has been a divisive candidate, not only within America but within his own party; he proved so abhorrent to some Republicans, including over 60 Republican senators, that they broke party ranks to vote against him entirely. Post-election, if Clinton wins, the Republicans will be facing an almighty reckoning on their own place in the American landscape and the troubling momentum Trump harnessed to forge his way to the candidacy, breaking essentially every rule in the playbook as he did so ("a candidate shall release his or her tax returns," "a candidate's campaign will not survive allegations of sexual assault," "a candidate cannot possibly win support if he or she calls all Mexicans rapists," and so on). Will they continue to push towards the far right of the political spectrum, or will they reshape their agenda? Will there be a split that creates a third party, where Trumpites can pursue their agendas unrestrained by conservative Republican horror? Either way, this has been a wild ride that will leave Republican strategists fundamentally changed, and will likely alter the way the Grand Ole Party operates forever. Oh, you thought Hills getting into power was enough to give the patriarchy a smash? Think again. If Clinton wins the White House, another part of her platform that will doubtless attract formidable attention will be her championing of the Paycheck Fairness Act, which was part of her platform and is designed to address, in part, the continuing problems of wage inequality across America (which, might I remind you, are substantively worse for women of color). Clinton's been trying to get this bill passed since 2007, and she wouldn't let the opportunity slide once she was in the White House. It's a damn good bill, too, though it won't solve everything; it's designed to keep employers from punishing employees who compare salary information (which, by the way, is protected by federal law), train women to negotiate better salary outcomes, and put the onus on employers to demonstrate that wage gaps are caused by anything other than gender (and punish them severely if they can't). If you're looking for the one concrete way in which life would be different under Clinton for you as a working woman, the Paycheck Fairness Act is it. A Clinton presidency would be a strange new world, and, based on what we can predict, a better one. Tomorrow, fingers crossed, that work begins.